Zuger might be better remembered for ability as a punter rather than for his ability as a QB. That is not so much a slur on his quarterbacking skill, as it is praise for his punting. Three times in his career, Zuger average over 48 yards a punt. 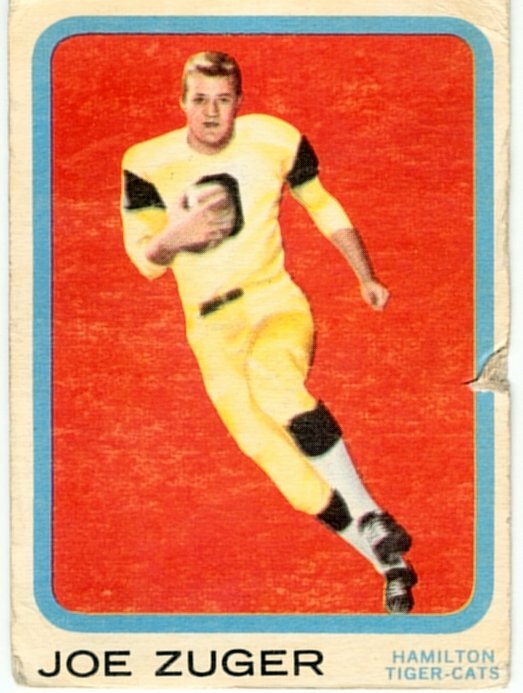 Zuger joined the Hamilton Tiger-Cats in 1962, and played his entire 10 year CFL career with Hamilton. In his rookie season, Zuger shared the QB duties with Canadian Frank Cosentino, as Hamilton's #1 QB, Bernie Faloney was injured.Zuger had a pretty good rookie seson, completing 55.7% of his 113 passes, and had an excllent 15 to 6 TD to Interception ratio. With Faloney back in 1963, Zuger became a full-time defensive back. He had actually had 4 interceptions in his rookie season, and added 5 more in 1963. Injuries limited Zuger to just 8 games in 1964, and in 1965, with the trading of Bernie Faloney to Montreal, Zuger moved back to QB. He shared the QB duties with Cosentino in 1965 and 1966, before taking over as the sole #1 QB in 1967. 1967 and 1968 were Zuger's best a as QB, both with over 300 pass attempsts and yards passing of 2771 and 2616 yards. Injuries cut Zuger back to only 11 games in 1969 and only 9 in 1970. In his final season, in 1971, Zuger returned to play all 14 games, completing 48.6% of his 265 passes for 1632 yards. Zuger had one missed fieldgoal return for 4 yards in 1962.